The building was built in 1923-1924 for the American Radiator Co., a heater manufacturing company. The 36-story building had one of the first set-back pyramidal silhouettes in the city, and another influenced by Saarinen's entry on the Chicago Tribune competition. The program for the building called for a relatively small structure, and to give the structure an enhanced appearance of a tower, Hood set the building back from the neighbouring buildings. The black brickwork on the facade was chosen to lessen the visual contrast between the walls and the windows and thus give the tower an effect of solidity and massiveness. 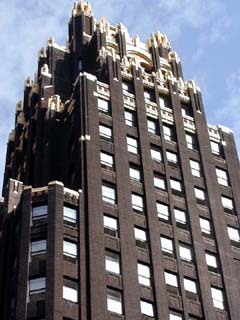 The Gothic-style pinnacles and the terra-cotta friezes on the edges of the setbacks are coated with gold. The base is clad in bronze plating and black granite. There are carved allegories, symbolizing the transformation of matter into energy, quite appropriate for a heater company. The entrance lobby is decorated with black marble and mirrors. In accordance with the line of manufacture of the builder, the building was designed with a display hall for American Radiator's heater products (arch. André Fouilhoux, 1937). 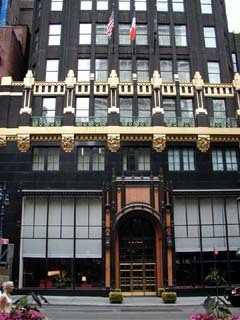 The entrance to American Standard (Radiator) Building.